As we peered down the incline, the space below us opened up into the workings of a full-sized underground ore mill, a complex of huge machines used to crush big hunks of ore-bearing rock down to smaller and smaller pieces for transport and further processing. 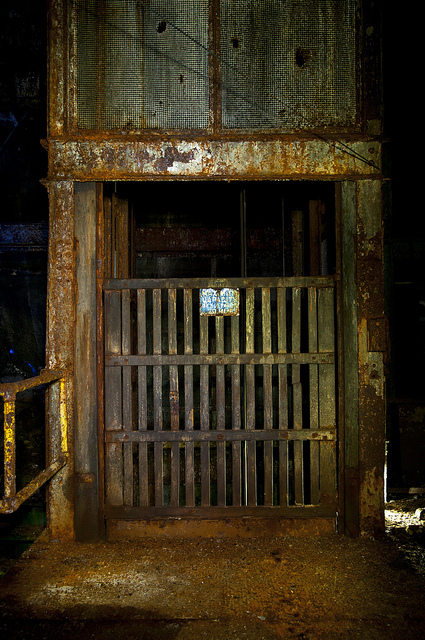 The miners dug out a cavern more than eight stories high in places, housing not only the huge rock crushers themselves, but more workspaces, a few company offices, and a conveyor system which fed the hungry workings of the various machines involved in the milling process. At peak output, an incredible 150-200 tons of ore could be processed in each 8-hour shift. 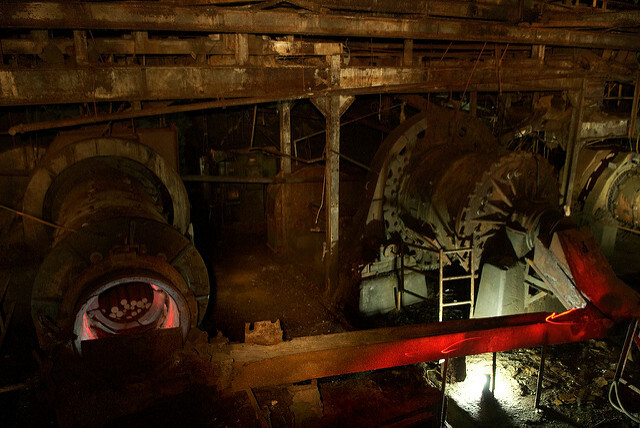 This was Belden's heart; the place where the huge machines that did the dirty business of milling the ore lived. Our voices bounced off the high walls and huge, silent machines, our breath hanging in the air, visible for seconds at a time after we exhaled before clinging to flat surfaces as shimmery drops of condensation. 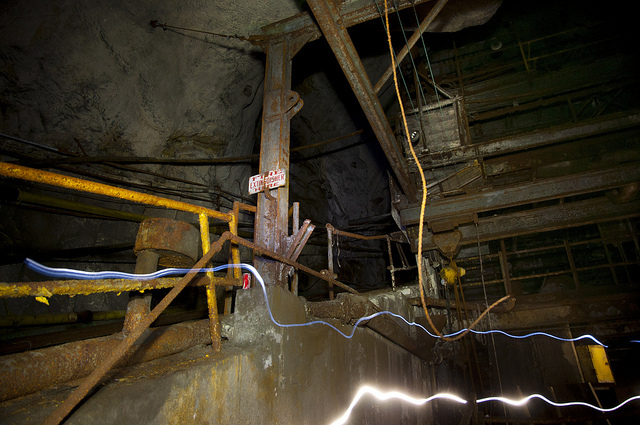 Years ago, this room would have been deafeningly loud with the sounds of mineral extraction: metal smashing rock, the hum of generators and engines, the shouting of the foremen as the carts crawled up and down the incline. Many of the slowly rusting ladders and stairs didn't even creak after years in the mountain - a testament to the skill of the men who dug this manmade cave out of the hard granite of western Colorado. It was almost time for us to head for the exit, as we'd be losing light in the canyon soon. Our exit from Belden took a different route than our entrance, and as we moved through the tunnels to the surface, the mill proved there were still surprises around the corner. A plastic tarp, ostensibly put there by the EPA during their cleanup, blocked off a side tunnel. 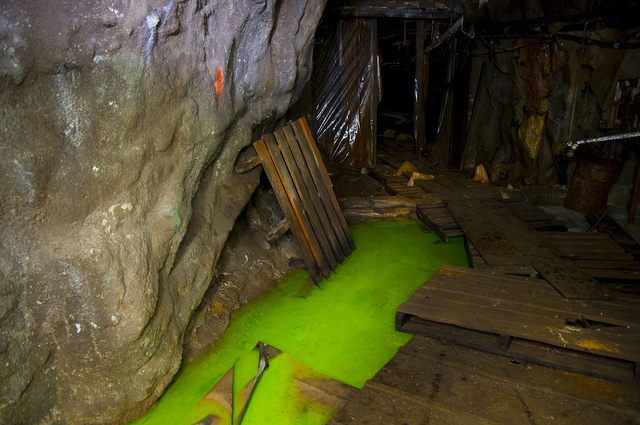 We investigated, and found that the room held something straight out of a video game: a cavern with electric lime green runoff beneath the makeshift floorboards. Once the room was confirmed to be mutant- and zombie-free, we moved in. Further back, we found a wooden catwalk which gave claustrophobic access to the top of a large holding tank. 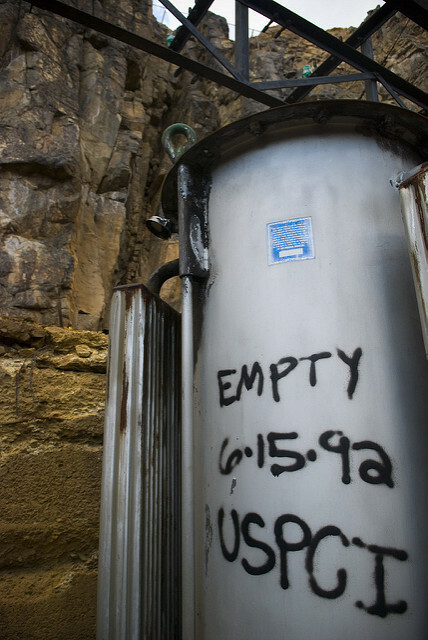 It seemed we had stumbled onto one of the EPA's mine water storage locations, part of their plan to clean up the Eagle Mine site. 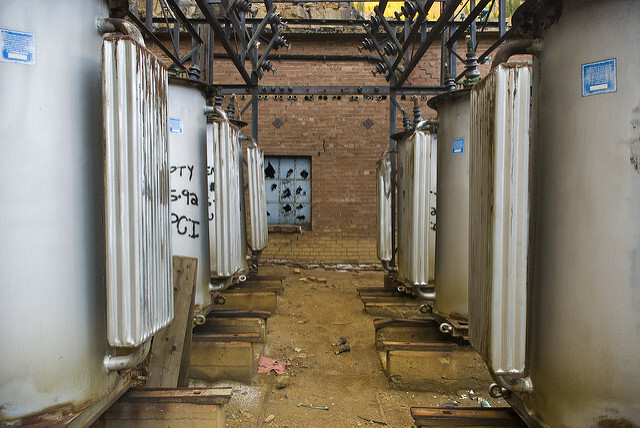 The idea here is that water in the tanks is to be drained and treated in a newly built water treatment plant near Bolts Lake, a few miles up the river. The unearthly shade of green may be a combination of antifreeze (added to the runoff water to keep it liquid during the frigid winter months) and copper leaching, but regardless of its chemical content, we decided the best course of action would be to continue out of the mountain and away from the neon green liquid. Tripods and cameras were packed and accounted for, and off we went. Our descent began, the four of us slowly making our way down the scree to the floor of the canyon below. An old steel cable, perhaps once used to move ore or power around the site, now made a makeshift fixed rope to steady us as we tried to keep our footing on the loose, constantly shifting mass of rocks. Before long, the team was once again on ground level. As the sun continued its arc towards the tops of the peaks hemming us in, we investigated some of the above ground buildings in the complex. 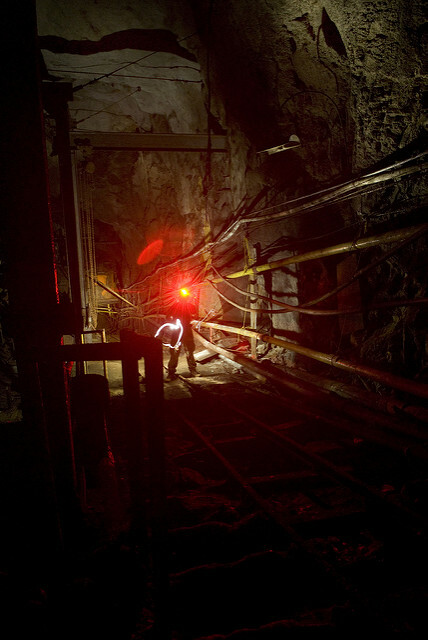 A small power substation near Darwin's Ladder once supplied the mine and mill with power enough to keep the machines inside running and the miles of lights on. It was from here that the fateful switch was thrown, plunging the underground into the darkness when the EPA finally pulled the plug. 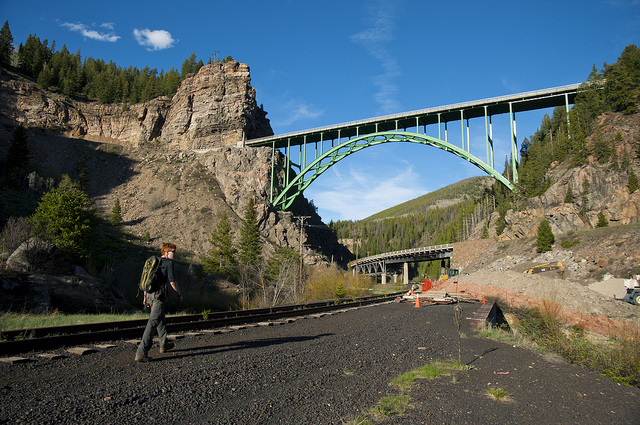 Our hike out began soon after, the four of us heading back down the tracks toward Red Cliff. The Tennessee Pass line that our boots now traversed was once the highest railroad mainline in America. 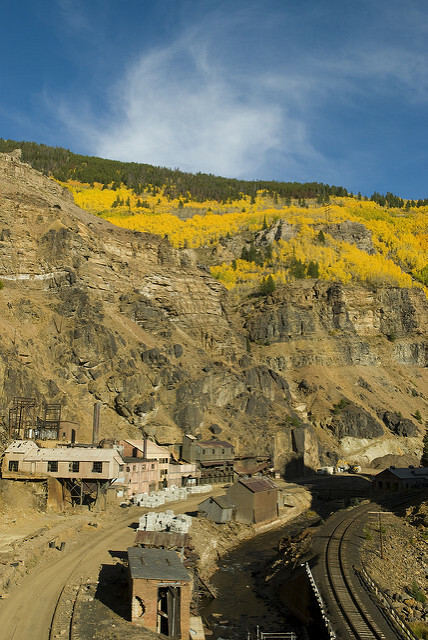 Built in the late 1800s by the Denver and Rio Grande Western Railway to beat the competing Colorado Midland to the mineral riches of the Leadville and Gilman districts, this line was for many years the primary transcontinental route through the Colorado Rockies. Southern Pacific bought the D&RGW in 1988, routing their huge 100-car coal trains up the line, some with as many as ten locomotives shoving them up the steep grades to the top of the pass. 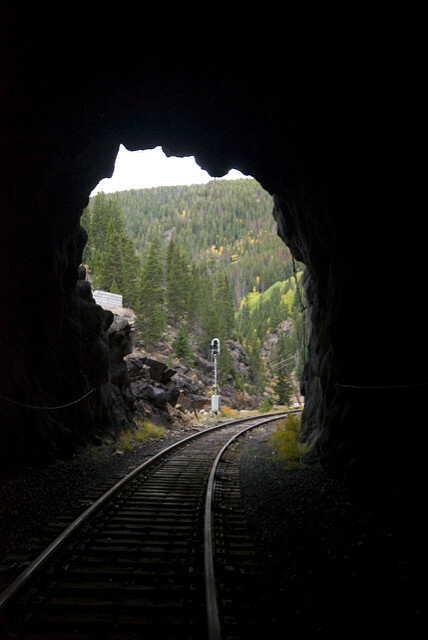 Eventually, Union Pacific bought out Southern Pacific, and with UP's ownership of the Moffat Tunnel and other routes through the Rockies farther north in Wyoming, this legendary route was shut down for good in 1997. Only the section through the Royal Gorge remains open as an excursion line. We arrived back at the car exhausted, but elated with the accomplishments of the preceding 48 hours. Only time will tell what becomes of Belden; recent work has been centered on stabilization and environmental monitoring. Unlike the town above it, redevelopment is not in the cards for Belden (after all, there's only so many things one can use a giant, contaminated underground mill for) so for now, only the slow, unyielding forces of decay will continue to work inside Battle Mountain.